Future Adobe AIR development will focus on incorporating features from the core Flash runtime. While desktop and mobile-specific APIs will be developed, they will not be the primary focus for Adobe AIR development efforts. Developers requiring functionality not available directly via Adobe AIR APIs should consider adding that functionality via the native extensibility API. Long story short: if you want a platform specific feature, do it yourself using ANE (Air Native Extensions). I think that is great! Flash has a strong community, so there will be plenty of talented developers and passionate people creating all sort of APIs to enhance the Flash/Air API itself. For that reason, I decided to revamp the AIR Native Extension category. The category now has sub-categories according to the platform, such as Android and iOS. It will allow developers to quickly search for the best ANE. I’ve been looking for ANE sites and authors for some time. Within the next weeks I will add a ton of new ANE to the site. If you know any cool site or is an ANE developer, please let me know! 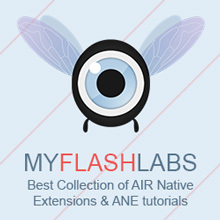 To increase the database of AIR native extensions, you can look at this website (http://extensionsforair.com/).